The Crumpet: Crumpet Blogger of The Month - Apply Now ! I hope you're all having a brilliant and relaxing Sunday. I am still in my PJs, but isn't that what Sundays are for ? Last week saw the launch of the Crumpet Amatuer Nail Art Contest for non-bloggers and bloggers with less than 50 followers. Today I am excited to launch the Crumpet Blogger of the Month Award for January. Due to the issues I had with the Nail Art Contest, there will be no voting on this one, but here's the rules and how it will work. - to enter, use the Add Your Link button at the end of this post to add 1 (just one) link to your favourite blog post you have done over the last 6 weeks. This is the only way to submit your entry. - you have until January 26th to enter, so that a winner can be chosen by the end of the month. - the winner will be announced on The Crumpet at the end of the month, where your "prize" will be exposure for several of your blog posts on this blog. 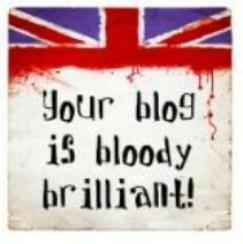 You can also (if you want to) do a Guest Post for me in February. So, that's it - go for it ! I'm really excited to see everyone's work. I love finding and promoting new blogs, and I will try and give as many honourable mentions as I can too.